During an emotional scene in the latest Rocky picture, Sylvester Stallone’s character is arguing with his son in the street on a rainy night in Philadelphia. When the aging boxer asks why he never comes to visit, he replies, "You cast a long shadow, and I need to get something for myself." The notoriety and fast track to the spotlight granted to the offspring of the famous always has been a double-edged sword. Recent history is full of examples of the cruelty afforded to them when they dare to step out on their own in an effort to claim some of the same territory occupied by their parents. The public seems to experience a viciously voyeuristic delight as critics sharpen their knives to slaughter them like fattened calves. The siren call beckoning these sons and daughters with promises of adulation and praise may be tempting, but it also has served to separate the rash from the patient and prudent. Who can forget Julian Lennon as he came first out of the gate after his father’s murder to release two albums and then never be heard from again? Years later, after the smoke had cleared and the ground was less planted with the critical landmines of unrealistic expectation, it was much safer for the infinitely more talented Sean Lennon to release his music and have it be judged on its own merits. A similar fate seems to have befallen Ziggy and Stephen Marley, the sons of the legendary Bob Marley. As the de facto front man of the Melody Makers, the Marley family band, Ziggy Marley released a series of albums in the ’80s and ’90s, including a pair of excellent endeavors (Conscious Party and One Bright Day) that were produced by the Talking Heads’ Chris Frantz and Tina Weymouth. The band toured the world continuously and gave many lively concerts, but the burden of expectation and pressure for Ziggy Marley to recapture his father’s musical magic caused the ensemble to implode creatively as the new millennium began. After several lackluster outings as well as concert set lists that increasingly were filled with Bob Marley’s songs rather than new material, it was clear that all was not well with the Melody Makers. The group finally broke up in 2003. Since then, Ziggy Marley’s solo albums have been received with critical indifference. It wasn’t until last year’s Welcome to Jamrock by Damian Marley (Bob Marley’s youngest son) that the bright lights began to shine once again upon the horizon of the first family of reggae. Bubbling with creative sounds, unconventional instrumentation, and a plethora of hip-hop influences, the album easily became a crossover hit. 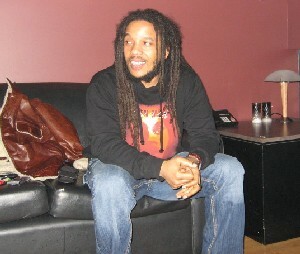 While Damian Marley received much of the credit for the outing, however, a closer examination revealed that it was second son Stephen Marley who was behind much of the disc’s creation. Critics long have considered him to be the dark horse of the family. Nevertheless, Stephen Marley’s mid-show raps and percussion jams not only elevated the Melody Makers’ concerts, but his songs also increasingly served as the highlights of the collective’s efforts. Still, it wasn’t until he produced the superb 1999 remix disc Chant Down Babylon — which paired his father with hip-hop stars such as Guru and Lauryn Hill — that Stephen Marley’s musical abilities came to the forefront. 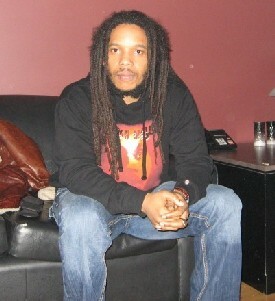 The anticipation surrounding the release of Mind Control, Stephen Marley’s long-awaited solo album, caused him to delay its unveiling more than once. Reportedly unsatisfied with the original versions and song selections, Marley quietly toiled away on the outing until he felt it was perfectly ready for the public’s ears. Realizing that anything he, or any of his siblings, created always will be viewed in the light cast by his father’s output, Marley obviously wanted to make certain that he had put his best foot forward before he allowed the world to listen to and judge his material. Currently, Stephen Marley is touring with his brother Damian in support of their recent efforts Mind Control and Welcome to Jamrock, respectively. Stephen kindly took some time before his sold-out show in Vancouver to talk with The Music Box about the journey to the album’s completion. Puffing reflectively on a spliff, he described his reasons for delaying the release of the effort: "We initially called it Got Music. Around that time, Jamrock came out, and it was picking up steam. We decided to let Jamrock do its thing, and we didn’t want to do anything that would lose momentum on that. My thing wasn’t as far ahead as his at that point. My shot wasn’t fired as yet." Mind Control is neither Survival nor Exodus — the latter album having been dubbed the best record of the 20th century by Time magazine — but it is a credible and often excellent piece of work. For the most part, Stephen Marley’s instincts are well-honed, and this is an effort that — if viewed objectively — any artist would be proud to release. The songs, for the most part, can be divided into two sections: There are those that sound a lot like classic Bob Marley tunes — Stephen’s voice, even more than Ziggy’s, sounds uncannily like his father’s — and those which incorporate aspects of hip-hop, jazz, and folk into the standard reggae mix. While the tunes that fall into the former camp — such as the title cut, Fed Up, and the beautiful Inna di Red, which features guitarist Ben Harper — are enjoyable, well-constructed roots-reggae tracks, it is the material that falls outside this box that is the most interesting because it points to Marley’s own considerable musical strengths. More than any of Bob Marley’s offspring, Stephen is clearly possessed by the spirit of musical creation, and like his father, he often writes more than a song a day. Consequently, he, too, has been criticized by reggae purists for the manner in which he incorporates rock sounds and Americanized guitar styles into his music, yet he feels no obligation to restrict his material. He is open to any musical textures that serve a song’s best interests. "It’s 2007, and you have to break new ground," he said. "It’s not a conscious decision to put flamenco or hip-hop into a song. That’s just ‘I and I’, y’know? I just write music." "The only sense of obligation I have when I create music is that it has to have integrity," he continued. "As far as creating music, I can do whatever I feel. Back then, in my father’s day, you could tell that it [reggae music] was like a movement. It’s different now. I’m not sure of it. You see new faces, and you don’t know if they’ve just come to be entertained or if they came to learn, y’know? Content is what gives music integrity. I can’t say there is a lot of content in most music. At the forefront, there are a lot of very creative people in the world — y’know what I mean? — and, they are not being heard. That’s what I mean by content. There is no content in the commercial side of music. That is what I am here to correct." Most notably, the plaintive cry of Lonely Avenue finally reveals a Marley who may possess some of the emotional and lyrical depth of his musical forebear. A beautiful and emotional reworking of the Ray Charles classic, Lonely Avenue hints at the musical greatness that Marley certainly possesses and is learning how to nurture and control. "The first time I heard it," he explained, "I knew what I would do with it." "It’s because of the lyrics" — Marley closes his eyes and sings, "The room has two windows, the sunshine never comes through" — "It reminded me of Concrete Jungle [a song off of Bob Marley’s classic album Catch a Fire] when my father sings ‘no sun will shine in my day today.’ I heard a reggae tune in the lyrics. I went in and recorded it, and I got it first time. No playing around." Lonely Avenue as well as the aforementioned Inna di Red reveal a dark and brooding side to the young Marley that is further evoked with moody acoustic guitars and low-key instrumentation. For those who came to dance, however, Hey Baby features a duet with Mos Def that won’t let the listener stop moving. Likewise, the superb The Traffic Jam, a depiction of a recent bust for marijuana possession that he sings with his brother Damian, may be the most insistently bubbling and grooving reggae track to come out so far this year. While the tune’s pulsing beat may cause some listeners to forgo listening to the lyrics, there is, like most Marley songs, a serious undercurrent embedded in the tune’s uplifting delivery. "Man, it’s still a heavy scene dealing with smoking herb in the States," he said. "I mean...I smoke herb for righteous causes, not just for smoking purposes. It has a spirit with it that guides us through, but at the same time, there are bumps in the road. I smoke herb because it is a part of our culture. It is where we come from. We don’t see it as nothing. If you ask me if I have a spliff, I will say ‘you want a spliff?’ Of course, they still bust people in Jamaica. In my case, I have to watch out for a cop who is looking for some form of fame by busting me. It is his ego (and nothing else really) that would make him want to bust me." Without question, Mind Control is an album that has been a long time coming, and for once, even with all the hype, the wait has been worth it. Indeed, Stephen Marley’s opening volley into the musical marketplace as a solo artist is a solid and well-conceived affair, and it provides a strong indication of greater things to come. Marley, himself, insists that he is just starting to hit his stride. "Musically, I want to attain greatness," he said. "I want to write songs with great force, but I don’t feel I’m there yet. It’ll take a couple more ticks until I know. We’re focused and, yeah man, I’m enjoying the tour. All the music is in a collage, and we have to see what comes out." If the crowd’s reaction in Vancouver — imagine an audience of 1,200 on its feet for the whole show, singing the words to every song, bringing Marley and his band back for encore after encore — is any indication of the staying power of reggae music (and the Marley family in particular), then Stephen Marley’s modesty may be unfounded. He already may have attained the pinnacle of greatness for which he is reaching. Mind Control is available from Barnes & Noble.